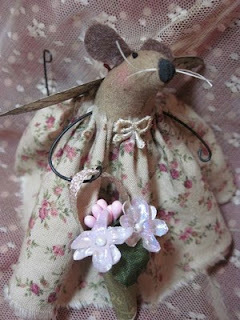 Wee Valentine Angel Mouse was my first offering for the giveaway. Now there's more!!! Yippee!! Aren't you happy, well I am. I found out about this fun event just a day or so ago and thought it would be lots of fun to enter. There are dozens and dozens of us gals and guys participating so please check out all the other giveaways too by clicking on the above box for more info. 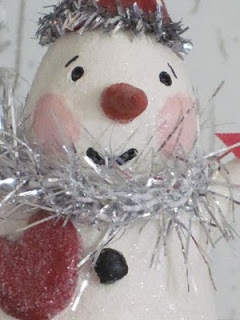 You can still enter my other Snowman blog giveaway by commenting on that post. Good luck. What the One World blog giveaway is about! To bring bloggers from all around the world for fun, exchange blogging, and lots of giveaways. 1.Enter your comment on this post only. 2. Leave name/email address or some way to contact you if you win. If you don't I will have to draw again. Hate you to miss out on all this fun. 4. 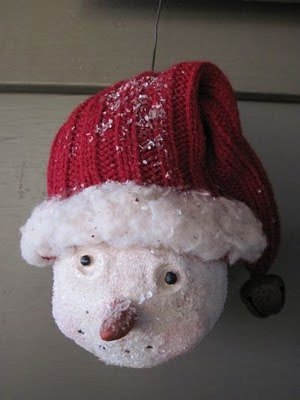 For the Snowman Giveaway enter your name on that blog post only. You can enter both blog giveaways. Go ahead, this is supposed to be fun. Who knows, you just might win both. Good luck. Okay my new blog giveaway is the very first pic at the top. She is 3.5" tall. She is carrying a tusse musse with pretty pink flowers tucked inside. She is made of muslin and her arms and tail are created from wire. "Oh dear, they look like seals don't they. Hum. Lets see." Thats better. 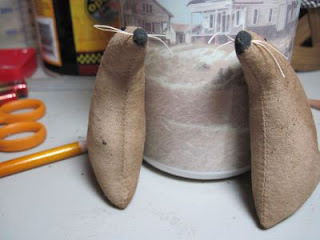 A couple of ears and some whiskers will do the trick. Oh, no. They think they are at the beach. That darn cup. "No, you can't go to the beach. No Naked Mice aloud. We must get you girls dressed. Then you can go to the beach....maybe." 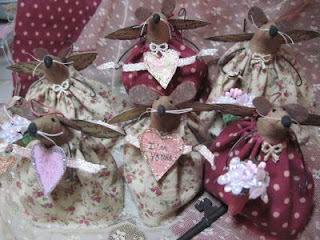 "You girls are going to be Valentine Angel Mice. See, here's your wings. What do you mean they look like bat wings"???? "Okay, these are better I think. The stamped wording add such a nice touch. Makes you looks so magistic. What do you mean you don't like magistic. Okay, sweet and sassy." " Sheesh, these mice are cranky!!! "May I introduce you to "Sweet and Sassy"? What do ya mean you don't like sweet and sassy??? Good golly what now? Oh, sweet and naughty. I don't think so!!! No naughty mice aloud. No naked or naughty mice aloud, this is a family friendly site young lady. " Ok, just sweet will do? Good...finally." "Well aren't you a pretty bunch. 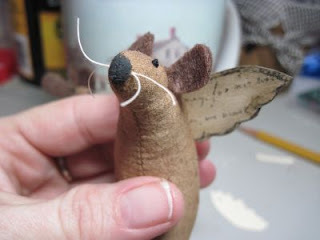 Ready to fly off and make someone's Valentine day a lovely one. I'm so proud of all of you. What do ya mean you don't want to fly off? Oh, you'll miss me. Your so wonderful. You have made your momma proud. Now go and make Valentine's Day special for another. Miss you." 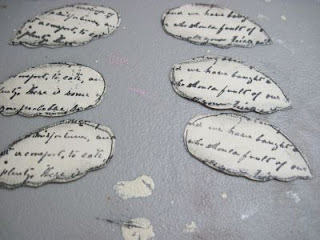 You can find these little lovelys at www.lemonpoppyseeds.com February 1st. See you there. Have a angelic Valentine Day! 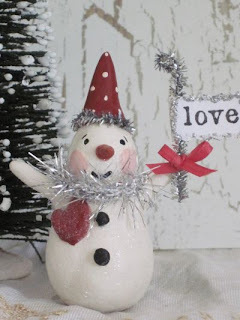 This sweet Snowman is a Valentine Blog Giveaway! It is my way of saying thanks to all my loyal customers and friends. All you have to do is take a moment to leave a comment or just your name and email address. This enters you in the drawing and if I pick your name on Feb. 14th you have won. Leaving a comment with your name and email address will help me contact you incase you have won. Ends Feb. 14th. Description of this little guy is below. If you leave a comment on any new additional posts, you will be included as well. Good luck. He's got a face only a mother could love...LOL! Or someone who needs a gentle smile. 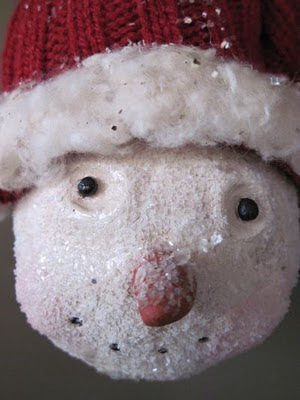 He is made of paperclay, paint, and lots of glitter. 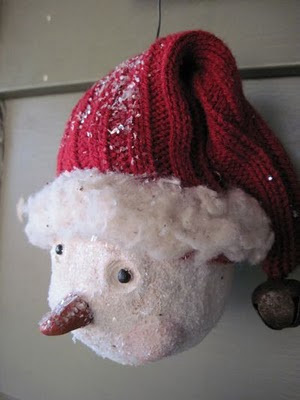 His hat is from an old red sweater and has a rusty bell attached. The faux fur is made of old quilt batting. Some call him primitive, while others call him vintage. Either way, he's a cold little fellow with a warm heart. It is true that the last year has been the rockiest year of my life with the exception of the year I lost my dad. With my marriage rocking harder than ever and living in my mother's house filled to the brim with people, it has been overwhelming to say the least. 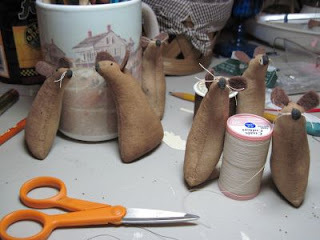 In early December I decided to start the close of my business since I could not find a spot anywhere to craft in my mother's overflowing house filled with people, dogs, and stuff. I regret coming to that decision. For most of you that believe God has a plan for our lives, I decided to start talking to my estranged husband about Christmas and where we will spend it. In our conversation, I opened up about the termoil and hardship my kids and I were suffering and we decided it would be best to move back...just as house mates. It has been such a blessing to be in my home again, even if it is not finished being renovated and possibly never will. I have hit my craft room running and am in the process of creating so many things that I have to take time to finish one project at a time. 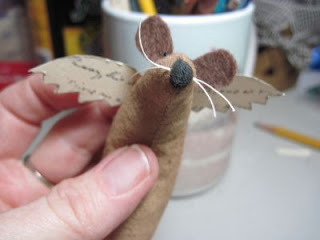 I am hoping in the very near future, I can aquire a camera since my daughter accidently broke mine and start taking pics of the creations I have been so happy to make and share with you. I do not want to close my business but will close my website for sure. It is to hard and costly to keep up with but you will be able to find my patterns/epatterns, dollies, and more here and on the below list. My goals for this year are to have give aways on my blog, continue to create patterns/epatterns, list on a new site or two and continue to create new and different creations to tickle your fancy. Thanks so much for being a part of my life. Happy New Year!